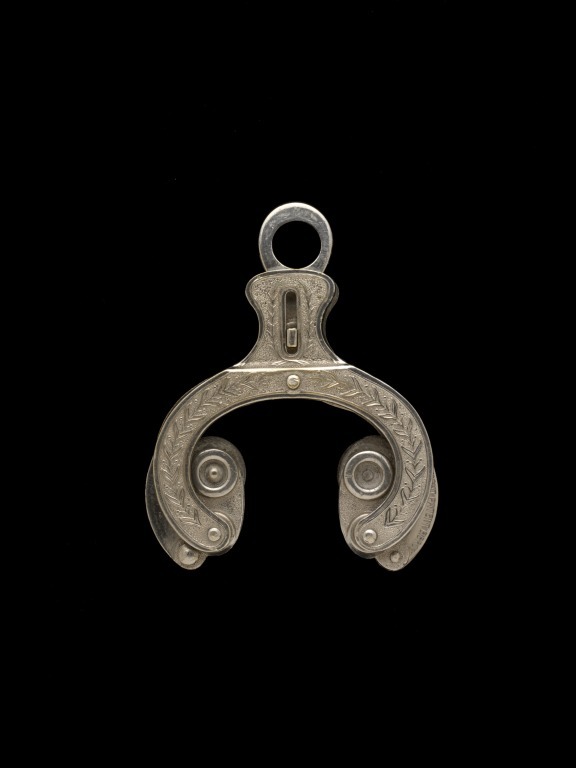 This dress holder would have been suspended by a chain from a chatelaine hook worn on the girdle of a woman's dress. It claims to be 'The Duchess of Connaught Patent', named in honour of Princess Louise Margaret of Prussia, who married Prince Arthur, Duke of Connaught and Strathearn and son of Queen Victoria, in 1879. Dress holder made of silver electroplate decorated on the two principal arms with low-relief fruiting laurel. The laurel decoration is inscribed with 'THE DUCHESS OF CONNAUGHT PATENT. B.BROS'. 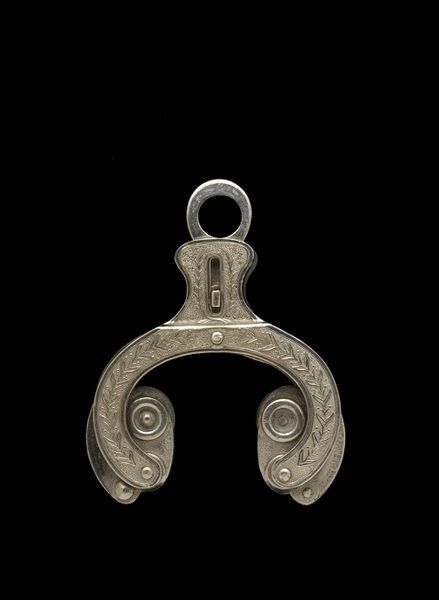 When a ring at the top is pulled upwards, it operates a mechanism inside the arms which brings together two small levers to act as jaws which would have held a fold of a woman's dress. When the ring is allowed to drop down, the levers move apart and the fabric is released. 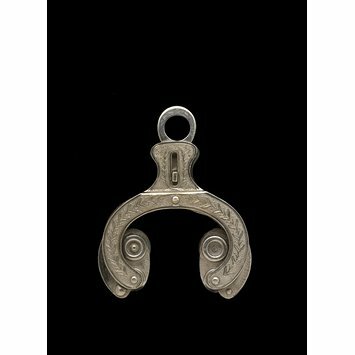 The grips of the two small levers are made of a dark cross-hatched material (untested). On mechanism inside the arms of the skirt holder. A number of makers who made silver or electroplate and used variations of a mark including 'B. Bros' are known, including Burgess Brothers of Birmingham, but confirmation that the firm made dress holders would be welcomed. Dress holders were devised to lift the outer skirt of a woman's dress when walking. There were many designs, including 'The Grappler', 'The Surprise' and 'The Eureka'. This example was a patent design named in honour of Princess Louise Margaret of Prussia, who became Duchess of Connaught on her marriage on 13 March 1879 to Prince Arthur, Duke of Connaught and Strathearn, son of Queen Victoria. The donor records that the dress holder was almost certainly owned by Mrs W. E. (Annie) Wallace (née Frankham, 1856-1943), whose husband, William Henry Wallace, was a noted floriculturalist. He won the Royal Horticultural Society Victoria Medal of Honour in 1927, and was a county alderman and Justice of the Peace. The firm of W. E. Wallace and Son Limited specialised in carnations, following the gift of some cuttings from Leopold de Rothschild in 1904. Carnations were supplied to among others, Buckingham Palace and the Royal Yacht. W.E. Wallace's son was William Henry Wallace whose sister, Mrs P. S. (Winifred May) Oates (1900-92) definitely owned the dress holder. From her it passed to a daughter of W. H. Wallace, Enid. M. Church (née Wallace; 1913-2008). Cummins, Genevieve E, and Nerylla D. Taunton. Chatelaines: Utility to Glorious Extravagance. Woodbridge: Antique Collectors' Club, 1994. Ridgway, Maurice H., and Philip T. Priestley. The Compendium of Chester Gold and Silver Marks 1570 - 1962. Woodbridge: Antique Collectors' Club, 2004.